Rockler's vast product selection is a woodworker's dream, offering the most up-to-date and hard-to-find woodworking hardware, kits, tools, lumber, plus their exclusive shop table line. Woodworking power tools -- From Jet, Delta, and Laguna woodworking routers to top rated table saws, drill presses, planers and joiners, they have the tools every woodworker wants for their workshop. Hand Tools -- Browse their huge selection of quality hand tools for every type of project. Experienced wood crafters know that cheap discount tools won't yield projects you'll be proud to show off. Rockler offers only high quality hand tools you can count on, at a great price every day. Project plans -- Whether you're looking for complex or simple woodworking plans, or other how-to materials, they have the plans, books and videos designed to make sure your woodworking projects come out the way you imagined. Trim and parts -- Check out the Rockler hardware collection for all finishing touches you need to complete your projects. Choose from their inventory of drawer pulls, hinges, latches, slides, brackets and more for your new cabinets, shelves and furniture, or to add a new look to older pieces. Woodshop supplies -- Create the woodshop of your dreams with woodworking equipment, storage, tool boxes, or a new woodworking workbench. 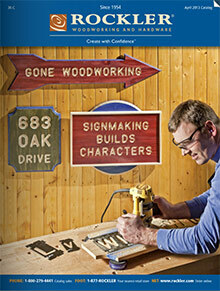 Rockler carries Children's Woodworking Kits, Exotic Woods from Around the World, "exclusive" products and much more. They're dedicated helping out to both long-time woodworkers and those new to the craft, including the many women who are now discovering the satisfaction of woodworking. Whether you're a seasoned woodworking pro, home-improvement enthusiast, craftsperson or a novice, Rockler has the woodworking power tools, hand tools, and other woodworking supplies you need. You'll enjoy browsing through their print & on-line woodworking catalogs, plus you'll receive their e-mail newsletter full of interesting ideas and helpful wood crafting tips. For the best in tools and supplies from the company that's always on the lookout for new ways to make all your woodworking projects fulfilling and successful, you need Rockler Woodworking and Hardware.